Built on the legacy CodeIgniter v2.2.6 and FullCalendar v* fused like a“Super Saiyan Fusion”. 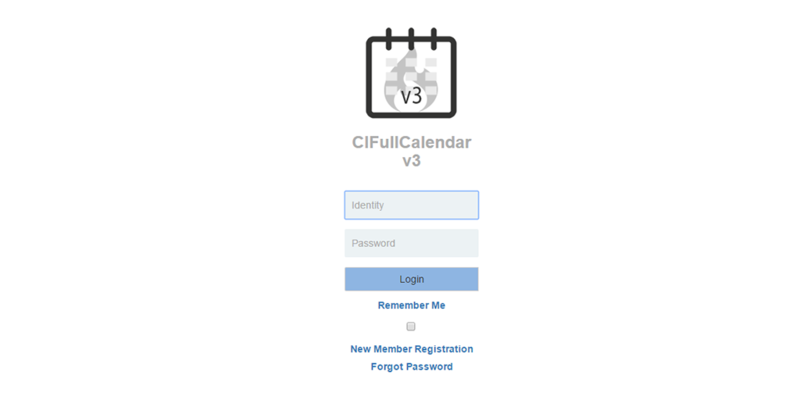 CIFullCalendar is a server-side dynamic web application that is responsive to any layout of a viewing screen. The “Super Saiyan Fusion” power of CIFullCalendar allows users to organize, plan and share events to everyone. Simply, install it to your server and become a member then use the wonderful features by easily manipulating your events by dragging, dropping, resizing, clicking, touching, categorizing, grouping, filtering, linking and importing/exporting. In addition, please see features. How can I use this script on my site? If you already or considering having a site or a web application built on CodeIgniter framework, styled by bootstrap or other responsive theme and storing the data on MySQL or any supported databases. This calendar script can be very useful. For example, if you like to create an event site, booking site, appointment site, personal scheduling site, or any other site using CI framework; the script can be easily plug-in into it. The idea is to display shared events on a calendar on your frontend (visitors page) of your site and control it at the backend (admin page) similarly like any other CMS site that can easily edit contents and have it displayed to the public. Screen shots of CIFullcalendar in action. Supports MySQL or any CodeIgniter supported databases. JSON – Share all of your public events by url. (yoursite.com/home/json). RSS Feeds – Share your public events by rss feeds (yoursite.com/feeds). ICAL – Members are able to export a single event to their Google, Yahoo and live calendars or to a ICAL Format (ics/ical). Event Filtering – Easily filter/view your shared events on your calendar. Overlap – Deny or Allow events to overlap other events. Draggable Events - Allows members to easily drag and drop events by category on the calendar. Calendar settings - Allows administrator and members to adjust the FullCalendar settings easily. Attachments – Add/Update/Delete events with an attachment (txt,docx,zip...). Recurring Events – Add/Update/Delete events multiple times weekly, monthly etc. by clicking, touching, resizing and dragging. Background Events – Add events that appear as background highlights. Touch Support – Update or create events by touching or dragging events. Supported by many touch devices. Import/Export – Allowing members to Import and Export events in bulk using ical format (ics/ical). Search – Allowing visitors or members to search for public or their own private events. Event Category – Members are able to filter events by categories. Event Sources – Members are able to view calendar feeds from other urls on their own calendar. Notifications – Email notifications about public events and others. IonAuth - A simple and lightweight authentication library for the CodeIgniter framework. (Currently using IonAuth v2.6.0). Administration – Administrators of the site are able to moderate the site and other activities. Member Profile – Members of the site are able to manipulate their events and other activities. Group – Easily become or not a member of a particular group. CMS – Easily create/update/delete pages and page contents. Print friendly - Use your browser to print your calendar events in its current view. Template – Easily customize your own themes. (Currently using bootstrap v3.3.7). Icons – Easily add icons within your own themes. (Currently using font-awesome v4.6.3).